Now you can take the Espresso train straight to 15 on 7th Parktown North with the opening of Craft Coffee, sibling to the South African artisanal roastery in Jozi’s Newton, brew, er, bru! Manager Lovejoy Chirambasukwa and his team are full of beans and the bistro-style breakfast and lunch menu promises satiety with Eggs Benedict & salmon, smashed avo, or chicken mayo on toast. But if, like me, you’re just there for the java, Craft Coffee’s Baristas are better than anywhere else, being graduates of the first locally developed and SETA accredited Barista training academy in Newtown. The coffee is ethically sourced in a way that supports grassroots farmers and their baristas can even help you create your own custom blend. And if you’re not seeking a caffeine fix, there are other drinks such as hot chocolate, loose leaf tea and, freshly squeezed juices. 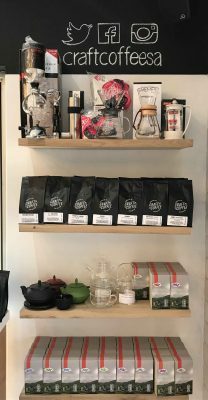 The roastery also sells their premium roasted coffee online or from their roastery at 50 GwiGwi Mrwebi Street, Newtown where you can decide which coffee suits your taste buds best. Craft Coffee Parktown North are open Monday to Friday, 06h30 to 16h30 and Saturday to Sunday, 07h30 to 14h00.